We pride ourselves in the quality of service that we provide to you. 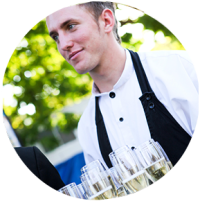 We know that waiters can make or break your event and are literally the ‘face of the function’. Therefore, our waiters are handpicked and personally trained, ensuring only the highest levels of service. They subscribe to a strict behavioural code of conduct that includes no smoking and no cell phones whilst on duty. Our waiters are punctual, professional, courteous, well-groomed and always willing to go the extra mile. Our team of Front of House Managers and waiters are fully briefed prior to the function and if required, receive information as to any special requests that you may have. Your event coordinator will consider practical issues such as the number of staff required and the optimum ratio of waiters and barmen to the number of guests to ensure the smooth running of your function.